This week's free cross stitch pattern is nice and simple. 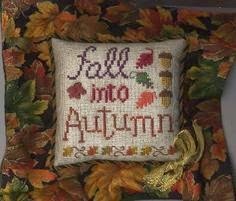 We're back to Fall/Autumn appreciation this week, but I wanted to take the time to share this pattern designed by Erica Michaels for Rainbow Gallery. It's kind of beautiful in its simplicity, and because it's fairly easy to stitch, it should work up pretty quickly, which is great if you're busy prepping for Thanksgiving next week. Another one my friend who loves Fall colors would love. Since this is a Rainbow Gallery design, it uses a lot of their specialty fibers and threads in the key. But you can always substitute your favorite floss for the specialty threads if needed. By the way, if you ever need a DMC color family reference for making substitutions, Yarn Tree has a great reference for that. Head over to Rainbow Gallery to view the PDF project sheet for this free cross stitch pattern.